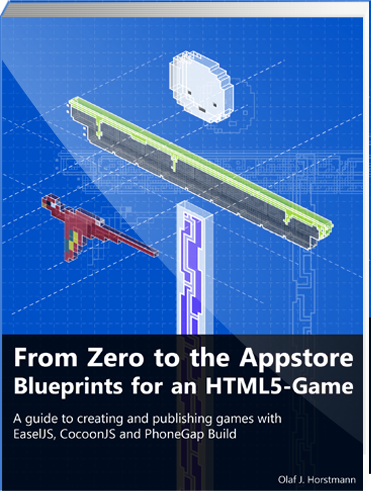 In this 5th and for the moment last part of my series on creating an html5-canvas-game I’m going to write about adding animations and other elements to polish up the game a little bit. The 4th part of my series on creating an EaselJS-Game is about adjusting the game to different display-sizes, which is very important when targeting mobile devices. To visualize, what the result is going to look like – I added the following two iframes, to demonstrate how the game adjusts to a different screen-/stage-size. Open this http://demos.indiegamr.com/jumpy/part4/index_nearestNeighbor.html in a new browser-window and see how it adjusts to your window-size as you reload the page after resizing the window. So this is going to be Part3 of my series on creating a retro style platform runner game for mobile devices. Originally I wanted to write about adding animations in this part, however I rethought the who whole part and find it more suitable to first add some movement and make the collision detection complete, as it is still just a very basic algorithm in the previous part. This is Part 2 of my tutorial on How to create a Runner Game for mobile with EaselJS – in this part i’m going to cover the collision-detection between two objects in EaselJS. 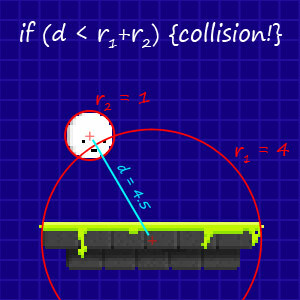 There are several types of collision detection methods, I’m going to explain two of the most commong ways to detect a collision – if you want more/detailed information on the subject I would encourage you to google for it or try this article as an introduction to the topic.